"Once I started reading this book, I could not put it down. Crisscrossing through time, the novel intermingles the narratives of a small group of people before and after a civilization destroying flu outbreak. 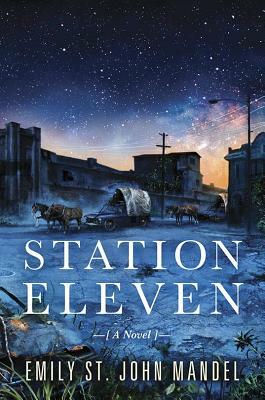 Showing how ephemeral our present day culture and relationships are, Station Eleven is the perfect novel for fans of the films of Sophia Coppola. RIYL: The Time-Traveler's Wife by Audrey Niffenegger." "A fantastic apocalyptic tale that is as much about the characters as the disaster. On the eve of a flu pandemic, actor Arthur Leander dies onstage. His story is unfolded as St. John Mandel weaves together his family and acquaintances. Time flows between past, present, and future as she explores art, survival, and ultimately, human connection." "The death of an actor on stage heralds the end of society as we know it in this eloquent and beautifully written novel. The connections that are made in the story transcend the collapse and illustrate how the most innocuous things can have significant value. The Traveling Symphony is a troupe of musicians and actors who travel the land entertaining isolated villages and among their number exist some who were around at the death of the actor, who remember a time when things were different; one keeps a copy of the unique graphic novel that the actor's first wife created, an illustrated note of hope that resonates with all the characters in unexpected ways." "I didn't want this book to end! Emily St. John Mandel has created an entirely plausible apocalypse and placed her fully realized characters right at the center of it. She effortlessly winds their seemingly unrelated stories together - I wasn't ready to say good-bye to her characters. It's a post-apocalyptic novel with heart."